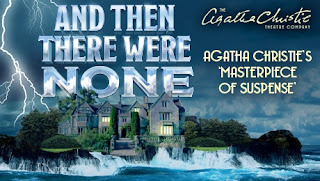 Arguably considered Agatha Christie's masterpiece, And Then There Were None remains amongst the most well known of all crime fiction and is Christie's best-selling title. First staged in 1943, and adapted by Christie herself this production has been set in 1939 and has been slightly adapted from Christie's original script by the production company to surprising, positive effect. The plot revolves around a group of strangers lured as guests to an isolated island where a mysterious voice announces judgement upon them for their apparent past "crimes". What follows is an excellent showcase for the plotting talents of the Queen of Crime as murder follows murder and paranoia blooms among the remaining guests. Of course, trying to work out whodunit is all part of the fun of an Agatha Christie plot and the play offers much for the avid audience member/armchair detective. The Agatha Christie Theatre Company has been creating fine productions of Christie's plays for the past decade and this is no exception. With assured, confident direction by Joe Harmston, who plays up the humour in Christie's writing, the play is never lax in engaging with its audience. It is true that there are moments when the laughs may be unintentional but the style is, at times, almost tongue in cheek and this is rather welcome in this spirited production where such amusement offers contrast to the sudden shocks that Harmston delivers. He handles the pace of the production easily and uses the space very well, investing the production with deft touches not inherent in Christie's script. The set design by Simon Scullion is attractive, evocative and well suits the Art Deco period and are a perfect backdrop to the elegant costumes designed by Roberto Surace. The lighting by Douglas Kuhrt is atmospheric, redolent and subtle as is the sound by Matthew Bugg. The only excess in these departments is the heavy-handed use of Latin chanting at the climax of the play. "And Then There Were None" is blessed with a strong cast led by the dominant performance of Paul Nicholas whose strength and stillness capture the character of "Sir Lawrence Wargrave" whilst his voice drips authority. Mark Wynter is equally as charismatic as "Doctor Armstrong" and is utterly striking as the flawed professional. Eric Carte, as "General Mackenzie", is another performer whose characterisation is perfectly balanced and whose delivery elevates Christie's text to near-poetry quality at times. Indeed, all the cast deliver the dialogue with ease and imbue the text with a quality that raises it above the sometimes dated language that typifies Christie's writing. Deborah Grant as "Emily Brent" is a prime example; surpassing the potential limitations in the period text effortlessly whilst Kezia Burrows overcomes the language in a more physical manner as "Vera Claythorne". Mark Curry, Colin Buchanan, Ben Nealon, Judith Rae and Jan Knightley all serve the play in an excellent manner whilst Tom McCarron, as "Anthony Marston", succeeds in overcoming the most stilted, archaic vocabulary present in the script, turning it into the most natural expression within the environment created onstage. The build up of pressure and tension does threaten to enter over-the-top territory before the dénouement and it is here the play could be refined as could the slightly overdrawn ending, but the production is never boring, flat or uneventful and is a considered, consistent, thoroughly enjoying, often thrilling production that will appeal to more than just die-hard Agatha Christie fans.